Now as my good friend Emma said, “Not every cloud has a silver lining”. This is why I have decided to review our recent visit to Belgo in Covent Garden – somewhat delayed but quite unforgettable (for all of the wrong reasons). Belgo is a Belgium inspired restaurant chain with five branches across London. The first thing I’d heard about the place was from a close friend, who described it as, “OHHH the one with the waiters dressed as monks?” and “Where the time you arrive is how much you pay for your meal?”, so you can imagine that I was more than a little intrigued to find out more for myself. A prime location, the Covent Garden branch is based very close to Seven Dials and has been aptly named Belgo Centraal. The main restaurant sits six feet under, in the bowels of the earth and opens up into a clinically lit dining area, a canteen setting with industrial features. We were ushered past long communal tressel tables in the main section through into one of the little coves at the back of the restaurant. Perhaps if we had been sat in the main body of the restaurant, my review would be a little more positive, as the coves lack character and atmosphere (on a wet Christmas lunchtime at least). Belgo’s offers a very competitive “express lunch” menu, the prices are quite unbelievable for London. The set menu has six courses to choose from and comes complete with a half pint, glass of wine or soft drink for £7.95. We both decided to stick to what the Belgians do best; moules frites and draft beer. Although it was touch and go whilst I weighed up whether or not to go for the rotisserie chicken instead. So we waited, and waited.. and waited a little more. Until our mains finally arrived – stone cold. I’m usually not one to complain but on this occasion it had over stepped the mark. The staff were pleasant, apologetic and more than happy to make sure the rest of our lunch was trouble free. 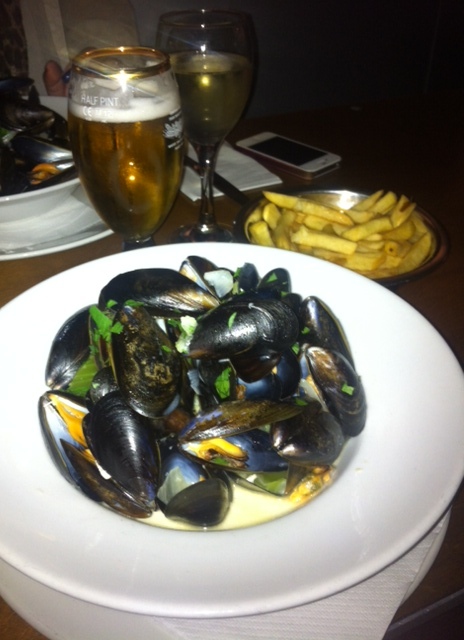 The mussels were on the small size but the portions were generous for £7.95, so we didn’t feel shortchanged. The restaurant’s thick cut, crispy chips were probably the highlight of the meal – and that’s saying something. The regular menu is substantial with a whole host of options to customise your moules marinere or rotiserrie chicken. If we were to return, I would certainly try one of their Houtenplanks (sharing platter), the ‘Snob’ specialty moules (moules marinere in a rich lobster, champagne and cream bisque) and finish off with a Belgian waffle. On their website, Belgo’s has a separate tab with a whole host of information on the beers that they serve in their restaurants. Of course, the Belgians are world renowned for their beers so if you are quite the fan, it could be the place for you. I wouldn’t go as far to call myself a refined beer drinker but I do know what I like; that’s generally flavourless with a lovely, thick frothy head. I think there’s nothing worse than a lackluster lager. The Belgo Pils I drank certainly ticked those boxes. In one word. Underwhelming. If you are looking for cheap, average eats, Belgo is your place. As for the monks, well I’m really not sure where that came from! What I do think is a good idea, is Belgo’s ‘Beat The Clock’ menu which is the same as the express lunch menu without the steak and starts from 5pm – 8.30pm, Monday – Friday. You will only pay the price of the time on your food order, ie. order at 5pm – pay £5, order at 7.30pm – pay £7.30. I think it’s a great idea, and a super way to get people talking about the restaurant. Have you visited any of the other Belgo restaurants? Perhaps Centraal isn’t the one to go to. As usual, please feel free to share your thoughts below. I have actually eaten in this one before when I worked just around the corner and haven’t ever had a bad moules frites, however service has often been slow. If you are on the hunt for good moules frites, another place to avoid at your peril is Leon de Bruxelle – I made that mistake recently. Ta lovely! They sure will be – although the restaurant reviews are on hold until my bank balance recovers after Christmas.